Posted in New Bike Time! 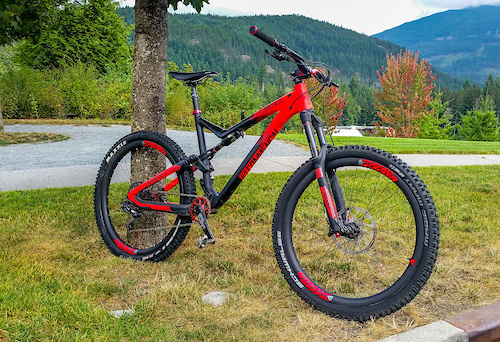 Giant Reign or Commencal Meta V4? New race in Squamish - The Spakwus 50 - Nov. 23, 2016, 7:37 p.m.
NSMB- 2016 - Mountain Bike Tread (Full Suspension) - Aug. 20, 2016, 6:38 a.m.
That's so hot. Nice job on the build. Chainring especially is a nice touch. What rear tire is that? Thanks! The rear tire is a 2.3 Minion DHR II. It's the stock tire which I might switch up to something faster rolling. NSMB- 2016 - Mountain Bike Tread (Full Suspension) - Aug. 13, 2016, 10:34 a.m.
New Bike Time! Giant Reign or Commencal Meta V4? - July 16, 2016, 9:58 a.m. I have a Meta AM V4 essential and having a blast on it so far. My last frame was a 2011 transition covert and the only thing I liked better about that bike was I got less pedal strikes on it when climbing than the Meta. I've had to adjust my pedaling a bit but it hasn't really been a problem. Chain reaction cycles £5 eVoucher up for grabs - March 23, 2015, 4:04 p.m.
Chain reaction cycles £5 eVoucher up for grabs - March 23, 2015, 12:30 p.m. They gave me a £5 eVoucher due to something I ordered being back ordered. It's good for three months for £5 any amount. I won't be using it so first person to PM me gets it. Going Tubeless - air compressor? - Feb. 20, 2015, 4:04 p.m. It helps to have constant airflow into the tire as opposed to the on/off airflow you get with a hand pump. Alpine riding in the Sea to Sky? - July 29, 2013, 7:15 p.m.
Head North to the chilcotins, you can get some alpine there, or even better the Yukon has great alpine! Thanks I knew about the Chilcotins but that's definitely not a day trip. I'm looking for something a bit closer. Alpine riding in the Sea to Sky? - July 29, 2013, 2:50 p.m. I'm looking to do more alpine riding/epics but I'm having a hard time finding places to ride in this area (that are legal anyway). I've already done Elfin lakes a couple times and it's nice but I'd like something longer and more single track. - Brandywine meadows - Are bikes allowed here? Is there even any good riding there? Does anyone have any more suggestions for alpine riding within a 2hr drive from Squamish? If you don't want to share publicly, send me a PM.